The Niagara Scow (also called The Old Scow) is the unofficial name of the wreck of a small scow that brought two men perilously close to plunging over the Horseshoe Falls, the largest of the Niagara Falls. The wreck can still be seen, upstream of the falls. On August 6, 1918, Gustave Lofberg and Frank Harris were aboard the scow dredging up sand banks from the Niagara River upstream of the waterfall. When tugboat captain John Wallace brought the Hassayampa over to bring the scow back to shore, however, it broke loose and began floating downriver rapidly towards the falls. There are conflicting reports whether Lofberg and Harris were able to release the false bottom of the scow to dump their load of sand and silt - but regardless, the boat got caught on a rock shoal 838 yards (766 m) from the edge of the falls, leaving the two Niagara Falls Power Company employees stranded in the middle of the raging torrents of water. Later reports suggest that Lofberg had tied a rope between himself and the scow as a safety precaution lest he fall overboard while the scow was still beached, while Harris tied one between himself and a free barrel. Since a rescue boat was out of the question, the Niagara Falls (Ontario) Fire Department tried using a grappling gun to shoot a life line out towards the barge, from atop the roof of the Toronto Power House while awaiting the arrival of the US Coast Guard from Youngstown, New York to bring a heavier grappling gun. When the US Coast Guard did arrive, they managed to send a lifeline over to the barge, and both marooned men made it safely back to shore via breeches buoy, 17 hours after they first found themselves drifting towards the falls. The hero of the day was noted riverman William "Red" Hill Sr., who tirelessly ventured out to free the tangled breeches buoy line several times throughout the night, and eventually assisted the men to safety. Local legend holds that overnight the hair of both of the stranded men had turned snow white from fear. Hill was awarded the Carnegie Medal for his efforts. Hill and his sons would be involved in many other river rescues and recoveries in the next several decades. A similar wreck, involving a wooden vessel, occurred in June 1923. The craft, previously a World War I submarine patrol boat called the Sunbeam, had been returned to its owner, a New Yorker, after the war ended. The owner sold the boat to a new owner, and the boat was taken west on the Erie Canal, to be docked at a port in Lake Erie. The crew made a navigation mistake and found themselves well into the Niagara river, though still several miles upstream from the falls. They retired for the night in a nearby hotel. During the night, the unmanned boat came loose from its moorings. The current carried the craft to the vicinity of the scow, and it likewise became caught in the shoals. The owners sold the wreck to Red Hill for a nominal sum, but Hill decided that the salvage cost was too high, so the boat remained marooned and by the late 1930s had broken apart. Some of its metallic parts are still visible at times when a significant quantity of water is being diverted for hydropower production. 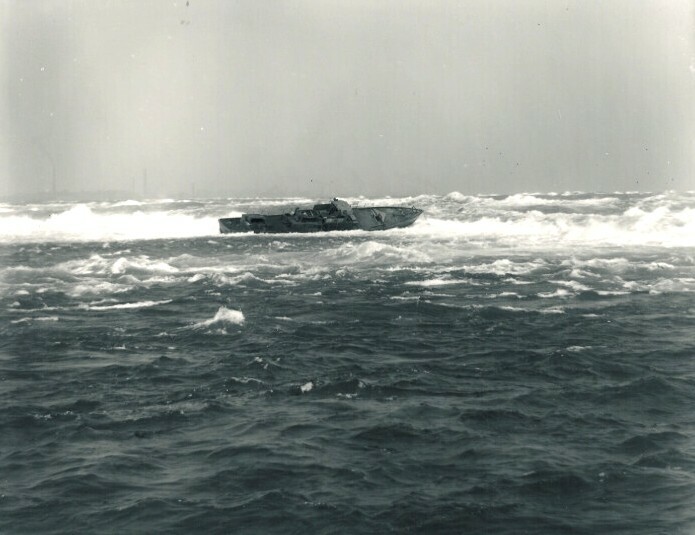 Although the source information is not completely definitive, this wreck appears to have been the USS Sunbeam III (SP-251), which was a subchaser during World War I, and was returned to its New York-based owner after the war concluded. ^ a b c d "Niagara Falls - The Scow and the Subchaser". www.niagarafrontier.com. Retrieved September 19, 2016. ^ "1918 rescue at the brink of the falls heralded". The Buffalo News. 2008-08-08. Retrieved September 19, 2016.